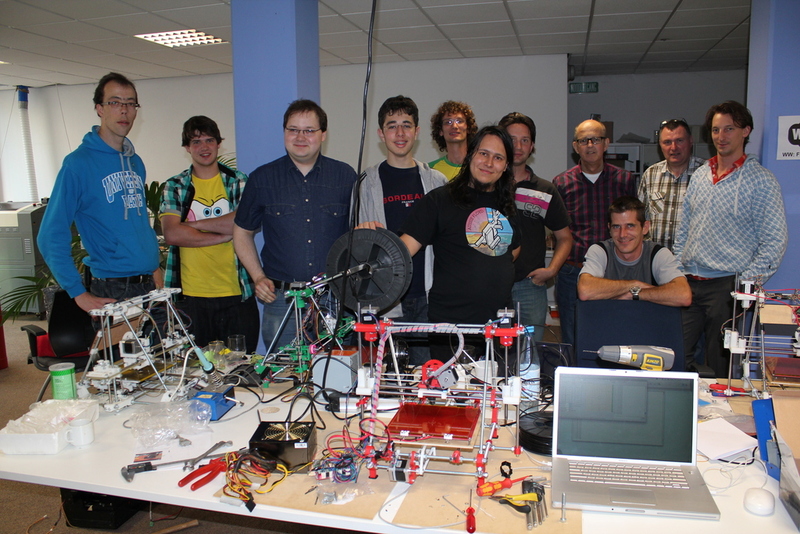 The build party was another big success, the 7 participant teams built themselves a brand new Reprap “Prusa i3“. The people from GarageLab were very helpful, and have a nice space to work at. We used the coworking space rooms to do our building. Thanks to Daniel Bruns and Carsten Born, they helped out a lot. Also thanks to Lab maintainer Axel Ganz for helping setting things up, and Yvonne Firdaus, the Coworking Space / GarageLab owner. We had a lot of help from the community people attending, there is a lot of information to be had when you are in a room with Kliment Yanev, Josef Prusa, Joachim Glauche, Nathan Zadoks and Ruben Lubbes. Also there was a group of locals working on their Reprap’s in the fablab itself, there were a few machines from our earlier parties present. It was nice seeing them improve the machines, and using them a lot. We built a reasonably new model, the Prusa i3, and it is a big improvement in building the machine. That was also one of the reasons the machines are so quick to be in use, most of the people were printing at the start of sunday afternoon, and everyone printed a model that looked pretty nice. The i3 is different from the model we used in our previous courses because it now uses a wooden box-frame that is very stiff, stable, and easy to build. Also it moves the motors to the bottom of the machine, so the Z-axis does not hang from the motors anymore. Also the amount of noise the machine makes is lower, and cable management is improved. Also the spool mount is integrated on top of the machine.This makes the i3 a very good option to build as your next Reprap. The design is still in developement, so for now the build info is still incomplete. We did most of the building in the first day, and were mostly doing the last part of the electronic setup on sunday morning. The electronics we used were ReprapDiscount RAMPS system, and jhead hotends. Most of the other parts were sourced at ReprapSource. Both of these performed very well. Around lunch most of the people were getting ready to print, and we made some cool models in the afternoon. Then we also did some presentations on the history of the project, getting help from the community, and some info on how to do 3D modelling with OpenSCAD. Just look at this 7,4cm tall Statue of Liberty, it is not very visible because of the background and transparent material, but the crown is really very nice. I hope we will get more pictures of that soon. Some pictures are already available here, but i hope to see more soon. And this time we managed to do a group picture again, so here it is! And finally: a timelapse of the build! I would like to personally thank Axel Funke, for driving me home afterward although he had to go a totally different direction to get home himself! We will be doing more of these buildparties, so if you want to organise one in your town or hackerspace, contact us! During the Reprap BuildParty in Düsseldorf Josef Prusa did an interview with me in his series of interviews about Reprap and the community, and he posted it to Youtube. In the interview we talk about me finding the project, collecting reprap memorabilia, my island promotion of Reprap, the history of IkMaak, why the courses are organised, and the way progress in the project is made. I’m rambling a bit, but i did not prepare for the video, so have fun! The FrankenBot project is also mentioned, if you want to join in with a part for that, get the part from the list, do anything you like with the design, as long as it is still functional, print it out, sign it, add some documentation, and send it to me! Contact me for more info. I hope you like the interview, there’s more where they came from. They are featured after the break. Another Reprap Buildparty is set to be held at the GarageLab in Düsseldorf on 27-28 october! 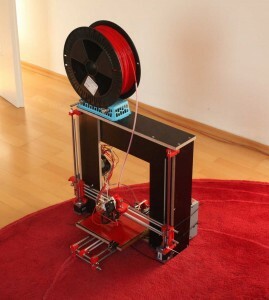 A unique chance to build your own Reprap 3D printer in just one weekend. 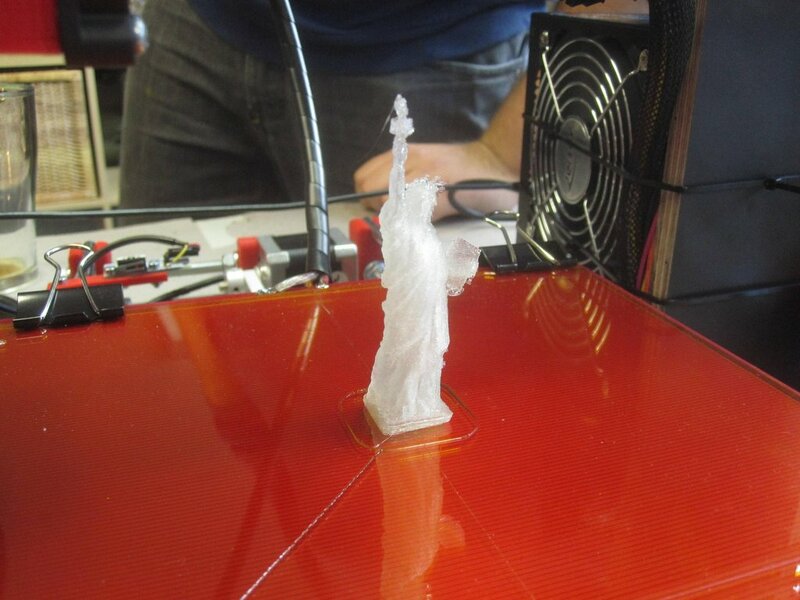 You will get all the parts and guidance from some of the most experienced reprap builders in the community. The machine being built is the Prusa i3, a recently developed but well-tested version of the popular Reprap type of 3D printers. The new Prusa iteration 3 model, the machine that is being built. With the help of will build the machine on the first day of the event and finish it on the morning of the second day. After that we will look into the workings of the machine, and how to operate the software. It is possible and even recommended to come as a team of two or more for extra fun. Josef Prusa, Kliment Yanev, Joachim Glauche, Ruben Lubbes and other community members will be there to help you. The course is given in German/English, but Dutch speaking community members are available. Also, if you are looking for another date, location, or other request, this can be taken into account, just mail us at info (at) ikmaak (dot) nl. Time: 27th and 28th of October 2012. Price: 850€ per printer. 1 or 2 builders per machine. Included in the course price are all the parts as well as some plastic print material. The electronics, hotend, and cable terminations will be done for you in advance. Food and drinks are included for up to two participants. Note that we have all these tools available onsite, but not enough for everyone. Please bring your own set of tools if at all possible. 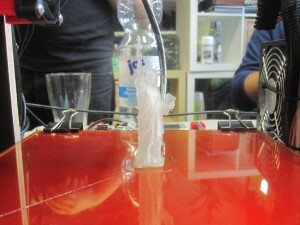 Another RepRap buildparty is going to take place in Berlin, Germany on the 18-19th of February (18-19-02-2012). Ten groups will have the opportunity to build their very own 3d printer, get it working, and take it home with them. After building the printers, we’ll look at control and design software, basic troubleshooting, and where to get designs, ideas, and help. At the end of the workshop, every participant or group will go home with a working printer. Time: 18th and 19th of February 2012, from 10.00h to 19.00h on both days. Impatient builders may continue past 19h on Saturday if they wish to, but that should not be necessary. Price: 850€ per printer. The number of participants per printer is not limited (though 2-3 is ideal). Included in the course price are all the parts as well as some plastic print material. The electronics, hotend, and cable terminations (the boring bits that eat a lot of time) will be done for you in advance. Are you not able to come to Berlin, but would liketo have one of these buildparty’s in your town, contact us too, so we can provide you with the options of having one. It is a great community builder! We have been having a great time on the first day of the course, doing almost all of the construction of the machines in one day. The Coworking Space Cologne/DingFabrik is where the event is being held is very nice, and very active, they organise meetings on friday evening, so come by when you are near! All the participants made the whole machine frame, hotend and other electronics, including hotend and heatbed, and even endstops. We mounted 2 already, only needing to attach the Z axis Hall-0 Endstops on day 2. This is a new record for us! First time builders making a machine almost entirely on one day! 🙂 We tried a new order of putting the parts together, so the difficult parts were done first, and then the frame would be setup as late in the process as possible. This way the progress is easyer to see, and you dont setup things wrong first, only to repair them later. We used different hotends this time, with IRC resident “jreifsnyderb” sponsoring hotends. We have used his J-Head Mk III-B, instead of the standard MakerGear ones we normally use in our build party’s. The buildup of these hotends is very easy, as they also come with groovemount, and are almost fully assembled. The second day was a bit more difficult, we spent most of it installing the software, as almost every machine was running a different OS. After that we could print some parts on every machine, and i think all people left with the feeling they had a good start in the world of RepRaps. We also built a RepRap for use in the DingFabrik, so they will have one there from now on. We will update this post soon to add the software package we used to provide the people with during the course. We used the Marlin Firmware on the bot, and Pronterface with Slic3r on the PC’s. 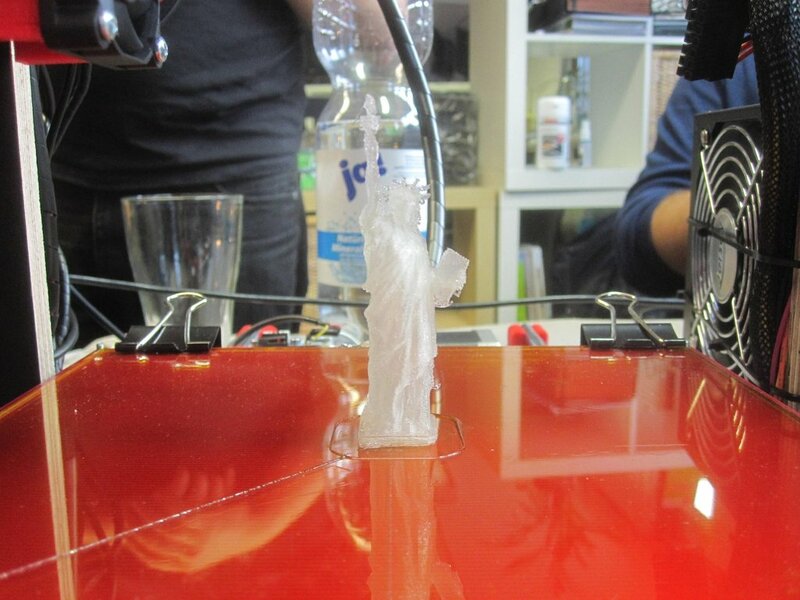 A reprap build workshop is going to take place in Cologne, Germany on the first weekend of December (3-4.12). Ten groups will have the opportunity to build their very own 3d printer, get it working, and take it home with them. Time: 3rd and 4th of December 2011, from 10.00h to 19.00h on both days. Impatient builders may continue past 19h on Saturday if they wish to, but that should not be necessary. Pictures of the event in Cologne are here! Cartesio is a printed multi-purpose desktop CNC machine, with a working space of 300x200x100mm(X,Y,Z). The machine is designed to hold multiple tools at its toolhead. This way one could connect a mill and/or a 3Dprint extruder and/or …. Cartesio is constructed from lightweight aluminium extruded profiles. These give the machine a very rigid construction, and alow for easy configuration of the machine. So if you want to change anything, i.g. the Z axis to a much longer configuration, it can be done very easily. The axis are powered by 3 NEMA23 steppers. These drive trapezoidal spindles that move 3mm per rotation. With these spindles you can generate a huge amount of power. The max feedrates, are 2400mm/min for X and Y, and 660mm/min for Z. The workspace only moves in Z-axis direction, and is supported on all 4 sides. This gives a very rigid workplane that does not move fast in X or Y direction. This is done, so that larger objects will not have stress/torque from (de)acceleration. The “gantry” type X and Y-axis make sure that a wide variaty of tools can be mounted to the toolholder. This kind of setup can result in a toolchanger in the future. At the moment a proxxon engraving tool (thankfully donated by Hegner) is mounted to the toolhead, together with the new 3Dprint Extruder. We would like to tell about some of the improvements we and others have made on the “traditional” RepRap design (traditional being last week?). That is why we will start this series. So here we go! One of the problems we have found while operating the machines here is the problem that it is difficult to get the Z height precisely right. While using opto or mechanical endstops you also run into different problems like bumping out of position or light influence. That is why our teammember Jos from Mauk.CC designed the Hall-O endstops. 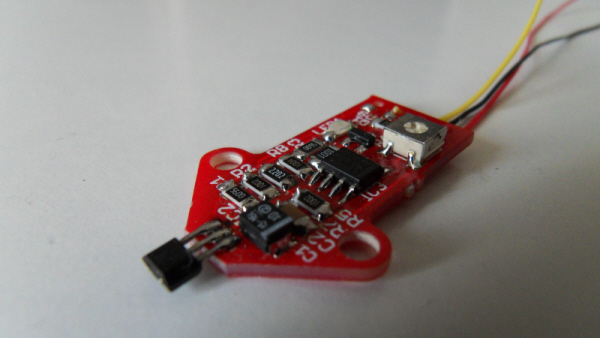 It is a contactless magnetic sensor, with a much higher precision than normal endstops. This enables us to set this once, and then forget about it untill the next retrofit of improvements. These endstops can be used as a drop-in replacement of other endstops, in all RepRap variants, and all other (cartesian) systems that need the precision. See the adapted endstop mount for easy mounting. They can be used on RAMPS, Sanguinololu and more. They make most sense on the Z axis on a RepRap, but for other machines this could vary, depending on the needed precision on these machines. It measures the distance to the magnet, so it can be set to trigger digitally at a set distance from the endstop, between 2-4mm with the standard magnet. The distance can be configured by the trimpot. This way it will not interfere with the movement or placement of the endstop, and it will keep in place without problems. It could also be used as a analog measurement device, but the current hardware and firmware used by the project do not allow for that yet. The endstop contains the endstop, a mounting cable, and a magnet, enough to get your Z height precisely defined. We have gotten a lot of them in the world already, so maybe we will see some reviews by others soon. Na onze geslaagde cursus in september hebben wij met de deelnemers afgesproken om samen met alle mensen nog een middag te houden om het verdere gebruik van de RepRap nog eens door te nemen. Hiervoor is zaterdag de 15e gekozen. Ook de mensen die de eerste cursus meededen zijn hiervoor natuurlijk uitgenodigd. Er komen weer een heel aantal mensen uit de community, zoals o.a. Kliment, Joachim, Nathan, Jos, ik, en meer. Het belooft een gezellige meeting te worden. We willen aan de technische kant vragen beantwoorden, meer vertellen over de software, en de mogelijkheden die de community biedt om samen te werken belichten. Verder is het een goede mogelijkheid om ervaringen onder elkaar uit te wisselen. De plaats is weer in het Fablab ZuidLimburg, in de Hoenderstraat 3 te Maastricht. Kom gerust ook, en neem je RepRap mee. De meeting is komende zaterdag de 15e, van 15 uur tot 18 uur. Zijn er nog onderdelen die men nodig heeft of graag wil hebben, geef dit dan van tevoren door, dan zorg ik dat deze aanwezig zijn. Ik probeer in ieder geval om diverse dingen aanwezig te hebben, om eventuele reparaties of upgrades te kunnen doen.